A colour photo from the Museums Chad Negative Collection, can anyone put names to the faces? Who can tell us more about this visit to Wembley? Rainworth Miners Welfare. 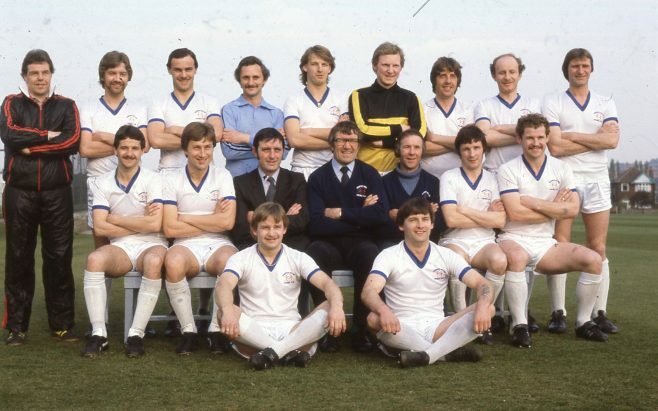 Back row left to right – R. Timms, A.Raine, D.Hallam, C. Watson, N. Robinson, B. Dawson, S. Murphy, J. Slater, T. Sterland, Middle row – M. Hodgson, D. Radzki, A. Wright, B. Phillips, J McGowen, A. Cooling, B Knowles, Front row – M. Oliver, B. Reah. It was a great achievement for this team to reach the FA Vase final at Wembley, unfortunately they lost 3 – 0 to a much stronger Forest Green Rovers team. But also in that season they won the Notts Alliance, the Notts Senior Cup and the Notts League Cup. They also had some great results in the earlier rounds of the FA Vase against much tougher opposition. They had a crowd of over 5,000 for the semi final at Rainworth which bettered 13 league attendances that day. It was a really tremendous season for this team. One player missing from the photo is Paul Comerford whose great wing play was instrumental in Rainworth’s success that season.